The reciporcating saw also known as a sawzall is an electrical cutting tool in which the cutting action is accomplished through the push and pull reciprocating motion of the blade (rather than rotating it). It is used to cut metal, wood, drywall, plaster, and tubing among other materials. It is most commonly used in the construction, demolition, plumbing, window fitting, and electrical work areas. It is also a very handy tool for any do-it-yourselfer or home repairman. This saw, also known as a sabre saw, recipro saw, or Sawzall (a trademark of the [Milwaukee] Electric Tool Company) has a large blade similar to that of a jigsaw and a handle designed to allow the saw to be used comfortably on vertical surfaces. The common design of this saw has a foot at the base of the blade (again similar to a jigsaw). The user can rest his foot against the surface being cut so that the tendency of the blade to push away from or pull towards the cut as the blade travels through its cycle can be countered. 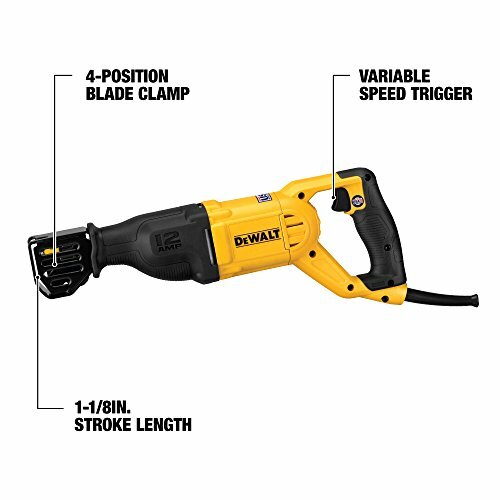 The multiple range of designs vary widely in speed, power, and features, from smaller, less powerful portable, handheld types which are normally shaped like a cordless drill, to the high-power, high-speed, corded models. Speed is measured in SPM (strokes per minute), and most new models all have variable speed, either through trigger sensitivity or through a dial. With the variable speed trigger, the harder you squeeze, the faster the blade moves. The stroke length refers to the distance that the blade travels in one forward cutting stroke (the standard length is 1-1/8 inches).The inclusion of an orbital action has become another important feature to how these saws are used. The action consists in the oscillation of the traversed reciprocation in an up and down fashion (this is perpendicular to the motion of the cut) which causes the tip of the blade to move in an oval pattern, back and forth as well as up and down. This feature is primarily used for wood, allowing the quickest cuts. Many of the newer models of recipro saws also come with a tool-free blade changing system, as well as an electric brake which stops the blade immediately when the trigger is released. The term reciprocating saw (or oscillating saw) is also used generically to refer to any saw which cuts with a back and forth motion. These include the sabre saw, scroll saw, jig saw, and rotary saw. The reciprocating saw provides the functionality and reliability that allows professionals and do-it-yourselfers to perform their work better and quicker. A good recipro saw will cut through everything from overgrown brush to the thickest of metal piping. Although most people may want one of these tools, not everyone knows how to find the best one for their individual needs. Here are a few simple steps to help you find the best reciprocating saw that best fits your needs. First you will need to think about what you will do with the saw. It’s always best to use your amount and type of use to determine which type of saw is best for you. If you will use the tool rarely and only for light trim work or other small maintenance jobs, you most likely do not need a saw with advanced features, but, if you find yourself always trimming trees or doing household demo work you probably will require a more industrial saw. For the heavy-duty user or the professional cutting through everything from metal piping to thick studs, you will definitely want a tool with more power attached to it. Now you need to decide between a corded or cordless model. Being able to maneuver wherever you may choose to go, a cordless power tool offers much more mobility; this is especially relevant when using a reciprocating saw as much of its use takes place outdoors. The corded tools, in contrast, provide a constant stream of high power without relying on a battery. They also tend to be lighter, but with the constant improvement in battery technology, the weight difference is becoming less and less of a factor. It really is more of a personal preference – I tend to choose the corded more often than the cordless, but I also do most of my work inside. If you already have a brand preference, this can quickly help you reduce your pool of choices. But, before you purchase the first brand you recognize, or, even one you know well, you should still do some research to compare the different brands to be sure you are choosing the saw which is right for you at a price that makes sense as well. Remember that no two tools are built exactly alike, as each manufacturer will excel in building one particular tool and model. We provide in-depth product details of many different brands and models in our REVIEWS section. meticulously manufactured. Sometimes you really do get what you paid for. A good warranty is another option to take into consideration. As long as you are investing in a quality, trusted product, having a solid warranty is a great thing to have. 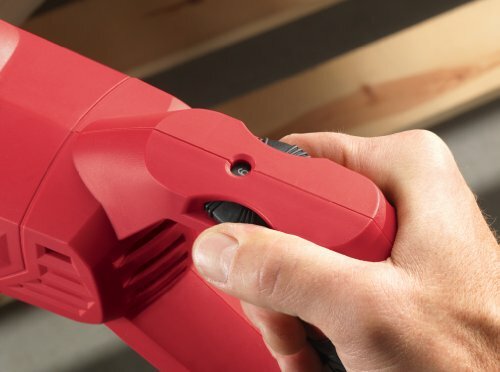 You will find that most industrial brands will include a one year warranty on corded tools, one year on batteries and chargers, and around three years on the cordless tools. If you can, it’s also good to actually hold and play a bit with a reciprocating saw before you make the actual purchase. If you are able to personally handle the saw before purchase this should ensure that you are totally satisfied with the feel of the tool and its balance, weight, etc. If this is not possible that is okay; just use your best judgement. You will find that having a good feel and comfortable fit with your tool will make sure your purchase was the right choice and a well informed decision. Finding the best tool will be a bit of a process, but it’s one you certainly will appreciate undertaking. The right reciprocating saw is out there for you and with a bit of research, it will be in your hands before you know it. A reciprocating saw has a large blade like a Jigsaw. It also has a handle that allows it to be used easily on vertical surfaces. The reciprocating saw makes a cut through a push and pull motion of the blade. Many reciprocating saws make straight cuts through a back and forth motion while other models cut in an orbital or rocking motion. The orbital action causes the tip of the blade to move in an oval pattern, up and down as well as back and forth. Because the blade of a reciprocating saw is only about an inch, it’s easy to change direction during a cutting motion. The saw’s blade can also be steered at much tighter angles than other types of saws. One other great benefit of the reciprocating saw over other saws is that, its’ blade has a very short stroke and is able to get into tight or awkward spaces. How fast can a reciprocating saw cut? A key consideration when choosing the best reciprocating saw for your purpose is the cutting speed. Cutting speed is determined by how may strokes the saw can produce in a minute and is measured in SPM (strokes per minute). A higher number is preferable to get the job done faster. Reciprocating saws either come with a single speed setting or a variable speed. Best reciprocating saws typically have a variable speed with minimum and maximum setting. The adjustable variable speed is either through trigger sensitivity or through a dial. It allows the user to control the speed of the reciprocating saw to match the cutting action. The harder the speed trigger is squeezed, the faster the blade moves. When using a variable speed saw, it is better to allow the saw to attain its highest speed before cutting. Blade Type: Which includes wood blades, metal blades and combination blades. Blades designed to cut metal have many teeth per inch, around 14 to 20, whereas blades designed to cut wood have fewer, around 6 to 8. They are not interchangeable, so make sure you’ve got the correct type installed before you start trying to cut. Blade Length: Before you can use a reciprocating saw successfully you must make sure the correct blade of the correct length is installed. They come in different lengths typically 6 to 10 inches. Generally, you always want to use the shortest blade that will do the job. 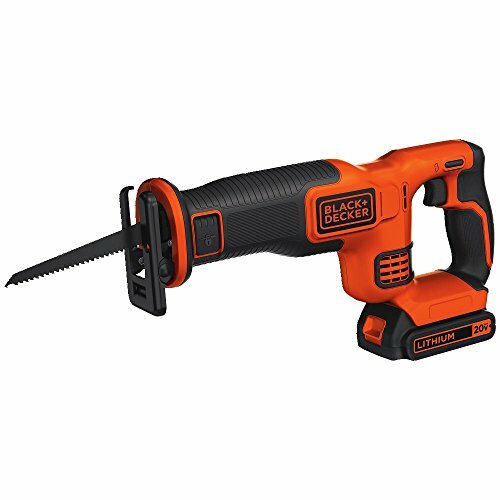 Corded reciprocating saws are powered through electric outlets while cordless ones are powered by a rechargeable battery. 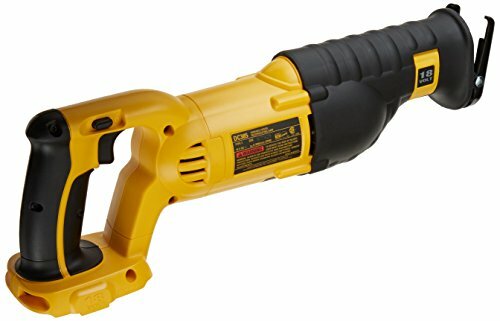 They tend to be more powerful and can scrape deeper into harder materials under highe pressure for longer than cordless models. Cordless models are a better choice for light users because they are smaller and portable. They can be used at sites without a power outlet. An obvious downside is that, a cordless reciprocating saw will require the purchase of more batteries in the future. Dust masks to prevent breathing dust created while sawing. A carrying case, to help protect the tool from damage. Continue reading our reviews and check out our comparison table above to decipher the best reciprocating saw for you!